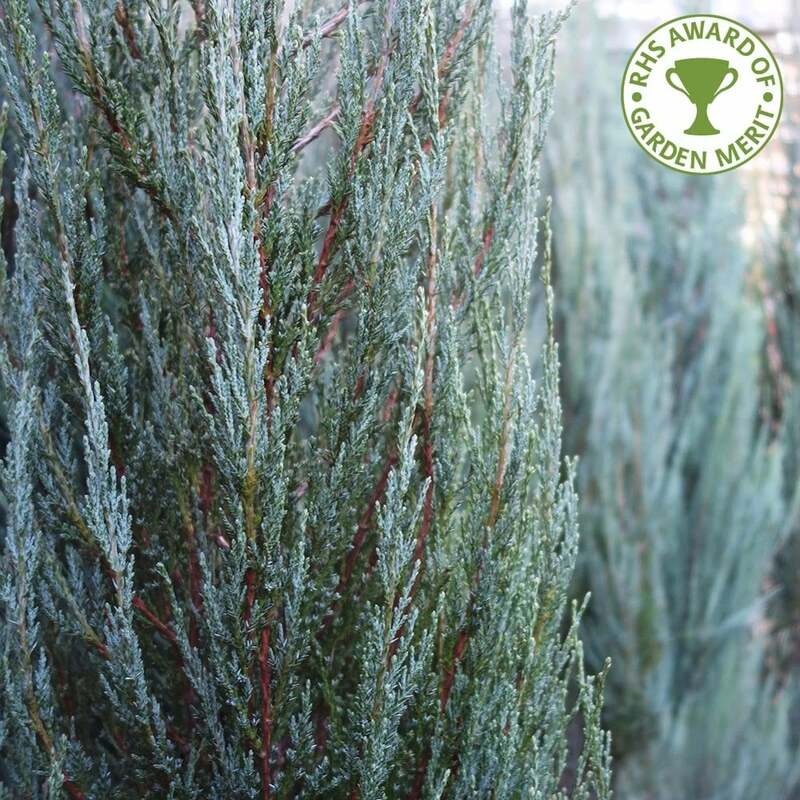 This award-winning small Juniper tree boasts vivid blue, evergreen foliage and an attractive very narrow, columnar shape. Juniperus scopulorum 'Blue Arrow' is a very useful tree for screening, adding structure or creating a focal point. These Juniper trees look great planted alone as a specimen tree or in groups of two or three for a formal garden theme. Blue Arrow, also known as the Blue Rocky Mountain tree, is tightly columnar in habit and will grow to around 2.5 x 0.5 metres in 20 years. Any well-drained soil in full or part sun will suit and this tree can tolerate some drought and exposure. Our pot grown Juniperus scopulorum Blue Arrow can be planted at any time of year. Remove weeds and grass within a metre of your desired planting hole. Dig a square hole as deep as your root mass and approximately 2x as wide. To help Blue Arrow establish more effectively, sprinkle Mycorrhizal rootgrow in the hole. Remove the pot, gently loosen the roots and place into the planting hole. Mix 50% of the original soil with 50% compost, fill in the hole and firm around gently. Avoid banking the soil up around the collar of the tree. Unless it is a particularly exposed location, there is no need to plant Blue Arrow Juniper trees with a stake and tie. If you’re planting Blue Rocky Mountain Juniper in spring or summer, water well and regularly for the first few months. Make sure to keep an eye on young trees and increase watering if there are extended periods of hot or dry weather. If you’re planting in autumn, you may only need to water your tree a little. We stock a range of irrigation kits to aid watering. Once planted, keep the area free of competing weeds and grass for the first couple of growing seasons. Blue Arrow Juniper trees may benefit from light pruning to maintain their columnar shape if required. Simply remove any dead, diseased or awkwardly placed branches from your Juniper tree as and when you see them. All trees are carefully packed by our experienced team and most are delivered within a week of placing the order (please allow up to 12 working days during busy periods). There's no need to be in to receive your order and you can request where it is left via the checkout. There is a slightly longer timescale on pleached and mature trees (trees over 2.5m in height) because we group orders together for specialist delivery - we will contact these customers to notify them of the delivery date. Trees on pre-order are still growing and an estimate of when they will be ready is given on the basket page. Orders will be despatched when all trees are ready. Gift trees and those required by a specific date can be accommodated with pleasure, although we accept no legal responsibility for late deliveries. Our nursery is a busy despatch centre, so please make an appointment to collect or view trees. For collections, despatch charges will be refunded. Mature and pleached trees or orders too large for pallet: Cost is calculated in the checkout process and varies by postcode. It is a one off charge and will not increase if you add to the order. The above prices exclude the Scottish Highlands, where delivery starts from £24.95 + vat and is calculated in the checkout process. Our courier charges are not viable for just one or two trees, but if you have a larger requirement then please do speak to us to see if we can find a solution. Supplied Size: Height measured from the top of the pot. Single Stem / Pruned and shaped: Classic shaped tree with a single stem that has had pruning to help create a beautiful, natural shape. Top grafted: A height noted next to this form refers to the length of clear stem, which will not grow taller. Only the head of branches will develop. Top grafted trees do not require complicated pruning and are ideal for small spaces. Feathered: A feathered tree has branches from the bottom of the trunk all the way up. These branches can be removed if a clear stem is required. Multi Stem: A multi stem tree has two or more stems arising from or near ground level, growing from one root system. Take care to buy a true multi-stem like all ours and not those that are 3 saplings in a pot to cheaply imitate them. Bush: A plant with many stems low down, rather than one clear stem. Clump: Several plants in one pot that can give the appearance of a multi stemmed and very bushy tree. Climber: A plant that is a natural climber and will be delivered usually running up a bamboo cane, ready to position in the garden. © 2019 Ornamental Trees Ltd. All Rights Reserved.